يشكل فندق Quest Bunbury Apartment Hotel بموقعه الممتاز في منطقة سياحة, شواطئ ضمن مدينة بانبورى، مكاناً ملائماً لقضاء العطلة بعيداً عن عجقة أيام العمل. يمكن من هنا للضيوف الاستمتاع بسهولة الوصول إلى كل ما تقدمه هذه المدينة النابضة بالحياة. سوف يعشق النزلاء موقع هذا الفندق، فهو قريب من أهم المعالم السياحية في المدينة كمثل مركز الدولفين, ‪Koombana Bay‬, ‪Revolution Public Artwork‬ . كما يقدم Quest Bunbury Apartment Hotel الكثير من الخدمات لإغناء رحلتك في بانبورى. يمكن الاستمتاع بمجموعة من الخدمات على أعلى المستويات في الفندق كمثل واي فاي مجاني في جميع الغرف, خدمة التنظيف يوميًا, توصيل من البقالية, خدمات بريدية, خدمة سيارات الأجرة. يمكن للنزلاء الاختيار من ضمن مجموعة من الغرف المصممة بعناية لتعكس جواً من الراحة، والتي يتجاوز عددها 52. إن مسار جولف - ضمن 3 كم, حمام سباحة خارجي, ملعب تنس, حديقة هو المكان الأمثل في الفندق للاسترخاء وتفريغ طاقتك بعد نهار طويل. يشكل Quest Bunbury Apartment Hotel بخدماته الراقية وموقعه الممتاز، قاعدة مثالية للاستمتاع بإقامتك في بانبورى. يكون مكتب الاستقبال مفتوحًا من الساعة 7 صباحًا إلى 10 مساءً يوم الاثنين إلى السبت ومن الساعة 8 صباحًا إلى 8 مساءً يوم الأحد وفي العطلات الرسمية. يجب على النزلاء الذين سيصلون في وقتٍ آخر -غير الأوقات المذكورة أن يتصلوا بالعقار مباشرةً قبيل وصولهم؛ وذلك حتى يمكن إجراء ترتيبات أخرى. We will be back!! Very Very Very Clean apartments. Very cosy, quiet and close to all facilities. We were originally booked for one night..but stayed two..would have stayed our last night there if they had a room available. We will definitely be back when in the area again!! Keep up the good work. It's near dolphin sightings (although we didn't see any). Friendly staff. Nice stay in this apartment. Good Location, big room, free parking, near beach. love that it's across the beach. It was just a one night stop for me before I head back to the city. Nothing bad to say, room is clean but quite small. The toilet can be hazardous for elderly or disabled as there is a platform to climb into the shower. Reception was very attentive and friendly - always nice to see a polite and cheerful staff. I love almost everything about our apartment - the lovely loft area (which kids would be thrilled to sleep in), the beautiful pool just right outside our apartment, the cosy little, fully functional kitchen that I can cook every meal.. It was an awesome experience to be staying there. The only drawback is there is only one bathroom in the apartment, so if you go with your family who take long baths, it may be quite tedious to be waiting for your turn to shower. And just a small thing to note - you can hear every single bit of sound that is being generated from the living room on the ground floor while you are in the loft area. Hence, if you & family are watching different channels (one at the living room downstairs & one at the loft area), you may have to accustom yourself to a lower tuned volume in order not to interrupt one another's TV programme. Conclusion: Love this Apartment! 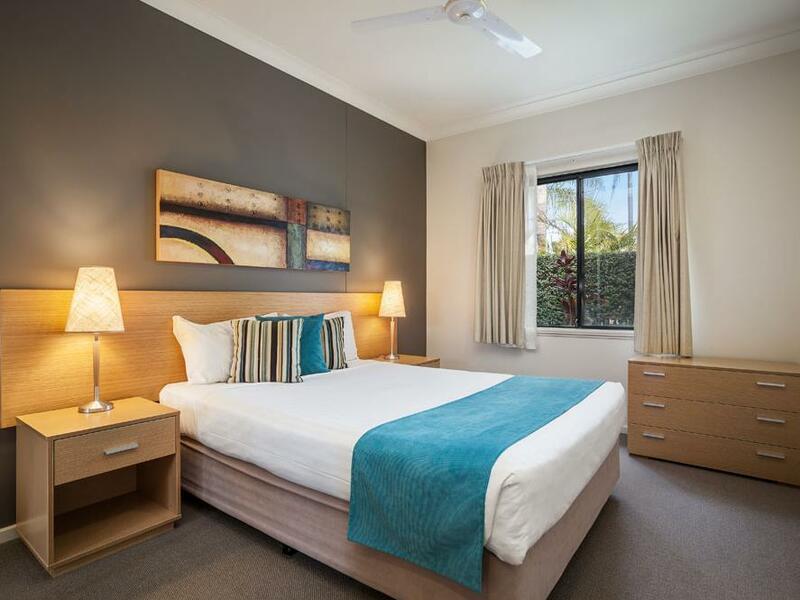 The Apartments are located in a quiet area that was easily accessible to the greater Bunbury area. the room was clean and well appointed with a comfortable bed. the BBQ/pool area was clean, and we used the BBQ which was clean. the two staff members that we were served by were extremely friendly and polite, and also most helpful in advising us of local attractions and meeting our requests. large and comfortable. pool was small but sufficient for a quick relaxing dip. short drive to town center for any needs. My husband and I were unable to keep this reservation as my husband was taken to hospital the night before. By the time I was able to cancel ,it was outside the 48 hour cancellation period. I rang Quest and explained thinking that I would have lost my money. I received a call a couple of hours later saying they would hold a credit for me to use at a later date. So even though we didn't get to stay I would rate this hotel very highly. Good public relations. I have told so many people about this. We were very impressed and look forward to a time when we will be able to stay. Stay was great but had 2 bedroom apartment,extremely overpriced. Only 1 bathroom and 1 toilet and it was barely a 2 bedroom!was more like a studio as the upstairs room didn't have walls or a door. I feel very ripped off as i could have had 2 separate rooms for the same price. Stay was good. But water heater was only sufficient for 3 adults instead of all 6 staying in apartment. It was a perfect location for us as we are travelling with 2 families and the hotel is able to provide a studio and 1 bedroom apartment for us. The staffs were really helpful and the room was clean and well maintain. Only set back was the wireless internet was having some issue and was constantly dropping off the line. However, we brought our own wireless mobile router, hence we did not alert the hotel staffs until we checked out. The family enjoyed the short stay over the apartment.Feeling great just like home. clean, well maintained, reception ladies are very friendly especially Mel.